WHAT'S A DEVIL MONKEY? : The United States and Canada aren't home to any modern-day primates, which makes the appearance of a giant monkey-like creature in rural areas even more bizarre to those who've seen it. Dubbed the devil monkey, this primate-looking beast reportedly has pointed ears, a baboon- or doglike snout, a bushy tail and only three toes on each of its narrow feet. Ranging in height between 3 and 8 feet (0.9 and 2.4 meters) tall, this strange monkey gets around on all fours and travels by jumping. Devil monkeys are supposed to be aggressive, especially toward dogs and humans, and by most accounts, they are carnivorous and feed on livestock. This fearsome monkey makes a wide range of evil-sounding noises, including hoots, whistles and screams. 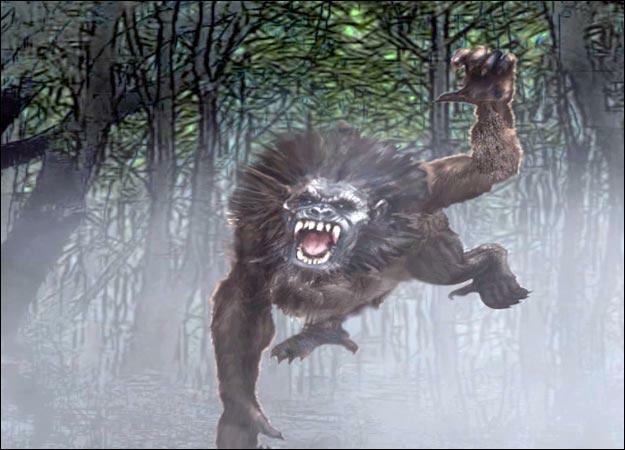 MONKEYING AROUND: According to George Eberhart, author and cryptid expert, the devil monkey can be found in British Columbia and the Appalachian Mountain region of the United States. One of the first reported sightings occurred in 1959 when a "monkeylike creature" rushed the car of a couple driving down a rural road in Virginia. A second encounter happened soon after, when two nurses reported that a similar creature tore the top off of their convertible. Other sightings have occurred as recently as 2001, when a giant black monkey was seen nine different times over the course of two weeks in rural New Hampshire. POSSIBLE EXPLANATIONS: Some people think devil monkeys could be feral monkeys that have been released into the wild or escaped from research facilities, such as the ones that broke free in Florida due to Hurricane Andrew in 1992. While that's possible, Cryptozoologists Chad Arment and Mark A. Hall suggests devil monkeys could actually be a surviving species once thought to be extinct, like a fruit-eating spider monkey originating from Brazil, or a large baboon that lived 650,000 years ago in East Africa.